As a volunteer on our Medicine project in Bolivia you may work in one of two public hospitals or various ‘Centros de Salud’; these are public health clinics that are open to everyone in Cochabamba, regardless of their ability to pay. At the Centros de Salud you can work in a variety of departments; possible options include paediatrics, gynaecology, admissions and pharmacy work. You can also get involved in community work, including vaccination programmes, which the clinics organise throughout the year. With basic facilities, the health clinics attend to mostly minor emergencies, accidents and routine visits. There is insufficient funding to maintain the facilities in complete working order, or provide the clinics with sufficient staff or materials. Volunteers are therefore needed to help and your work will be greatly appreciated. As a Medical volunteer, you may also be placed at a public hospital in the city centre that, although receiving little funding, has a well-known Burns Unit and patients often travel far to receive treatment there. More experienced volunteers will have the opportunity to enter the surgery room. The second hospital you may work at is a non-profit hospital where you will learn the regular medical procedures that are carried out by observing the professionals that work there. The staff at both hospitals will be more than willing to answer any questions that you may have. Projects Abroad organises regular workshops for our Medical volunteers. The workshops provide a greater understanding of Bolivia’s medical system and focus on many of the common medical issues facing the local people. Volunteers also visit local communities to provide health education in a wide variety of topics. The health education work and the workshops are supervised and run by a qualified nurse. Volunteers on all Medicine & Healthcare projects in Bolivia should be aged 18 or older and will need intermediate Spanish in order to communicate directly with the majority of doctors and patients. Many volunteers who lack confidence in their Spanish language ability take a Spanish Language course or join a Teaching or Care project before joining their Medicine & Healthcare programme. This gives you the opportunity to improve your language skills before starting the medical part of your placement. 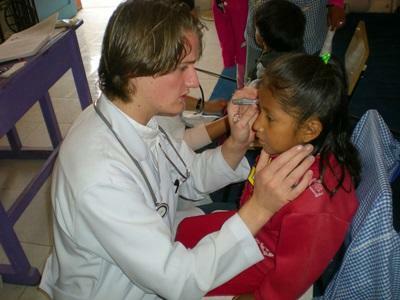 While in Bolivia as a Medical volunteer, you will live with a host family. You will spend much of your free time in the lively city of Cochabamba with the Projects Abroad volunteer community.